ELEGANT HOLIDAY HOUSE near the beach of Lido in a quiet cross street of Via Castelsardo. Located on the first floor of a new building, it consists of a large living area with kitchenette and sofa bed, a double bedroom with a terrace, another double bedroom, a bathroom with shower and a wardrobe; Complete the property with a large veranda furnished with table and chairs for alfresco dining, and enjoy pleasant moments of relaxation and reserved parking, which is very close to the beach given the difficulty of parking in the area. The apartment is equipped with every comfort: flat screen TV and air conditioning in the living room and in the rooms, dishwasher, washing machine, microwave, hair dryer, iron and ironing board, video intercom. Lido Beach is just 200 meters away. The historic center can be reached on foot in 15 minutes. The apartment is also convenient as it has all the important services nearby. 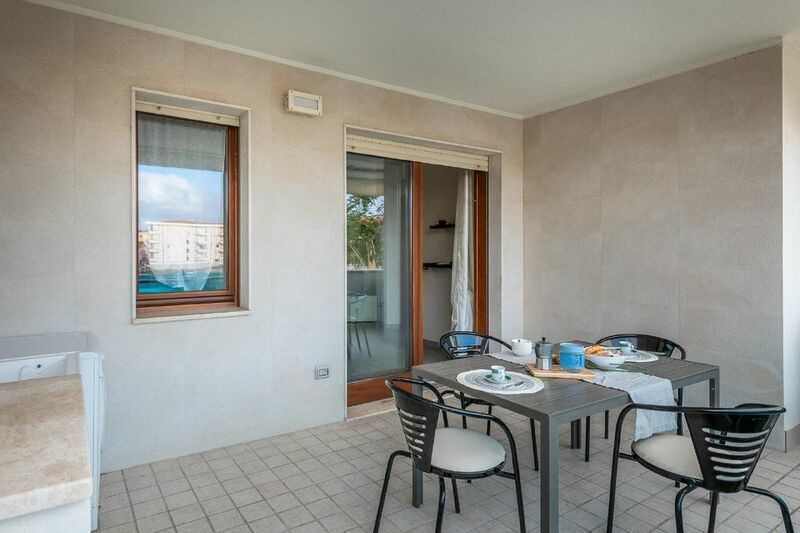 It is certainly the perfect holiday home for those who love the Lido beach, but also a good starting point for equally beautiful and unforgettable beaches like Lazzaretto, Le Bombarde and Porto Conte. The indicated prices refer to a maximum occupancy of 5 persons; for higher professions: 10 Euro per person per day. Consumption of water, electricity and gas: included in the rental price. Final cleaning: 60,00 €. Kitchenette and dishes clean and tidy leave; Otherwise a surcharge of € 50,00 will be charged. Linen rental with prior notification: € 20.00 per person. Late check-in on request (for arrivals after 8.00 pm): € 50.00; late check-out (after 10.00 am): one more night will be charged. Animals are not allowed. Tourist tax to be paid locally: for persons over 12 years and for a maximum of 7 consecutive nights 0.50 euros per person and day from 1. May to 30. September; In other periods 0.25 €. Deposit: 200,00 €. The customer takes care of the separate collection of waste and its disposal by following the collection table. The property for the return must be free of any waste, otherwise 50% of the deposit will be forfeited. Tourist tax: per object per day Costs of 0.25 EUR (obligatory). Final cleaning: per object and week costs in the amount of 75 EUR (obligatory). Linen (per person per week, according to consumption 10 EUR). Towels (per person per week, according to consumption 10 EUR). Additional bed (per person per day, perform 10 EUR by the tenant).